Richard Phillips sadly passed away in October 2015. His funeral took place at Worcester Crematorium on Friday 23rd October 2015. A collection was made for Oxfam which raised over £800. Enquiries should now be directed to Richard's son Will at mail@willphillips.org.uk. The Problem Pictures CD-ROMs are collections of colour photographs with activities for mathematics teaching. The AAMT Problem Pictures Calendars designed by Jacquie Sprott and Toby Spencer feature photographs taken by Richard Phillips printed in full colour. Order the 2016 calendar from Badsey Publications. Also available from AAMT in Australia. Richard Phillips is retired and dabbles in some of the projects described on this page. He lives in Badsey, Worcestershire, England. I do two types of photography. Photography for education includes Problem Pictures, the Pattern and Number exhibition, and work for educational publishers. I also work on composite documentary photography. Peoplescapes is a series of large photographic prints which show people in public spaces and their reactions to their environment. I am volunteer for OpenStreetMap (OSM), which is a free, community-generated map of the world. With a lot of help from my son, Will Phillips, we have set up the website Evesham Mapped which uses OSM data to create thematic maps of the Vale of Evesham, covering topics as diverse as fast food takeaways, listed buildings, rights of way and commemorative plaques. For the Badsey Society, a lively village history society, Richard has edited their book Aldington & Badsey: Villages in the Vale which was published in April 2009. He was also part of the team that produced the documentary film The Market Gardener. This had its first screening at the Regal Cinema in Evesham on 1 October 2012. He is a member of the Badsey website group. My family history webpages - a dreadfully addictive, time-wasting hobby! I have a talk, given to several family history groups, about my personal experiences of taking part in an international DNA study. It is intended as a simple introduction to DNA and family history. Reuben Bussey is a website about the artist who lived in nineteenth century Nottingham. He is a distant relative of mine. When you take a photograph, you flatten the world. This remarkable process is called perspective. In a clear, non-technical way, this book provides an introduction to perspective through looking at photographs. It covers practical issues such as what happens when photographs are joined together, and why photographs still look realistic when viewed obliquely. This is a book for anyone interested in perception, photography or geometry. Further information. Have you ever wondered how Room 101 got its name, or what you measure in oktas? Which number links Alice in Wonderland, rainbows and the Egyptian Book of the Dead? You will find the answers in Numbers. 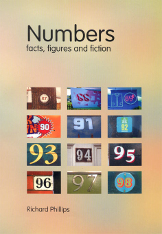 The book is full of facts, both mathematical and cultural, tantalising problems and anecdotes. A light-hearted reference book for all ages. This edition has been updated with dozens of new articles, illustrations and photographs. The main entries span the numbers from zero to 200. For further information see the Numbers: Facts, Figures and Fiction webpages. Richard Phillips has a background in education, psychology and design. Until 1998 he was a Reader in the School of Education at the University of Nottingham. He has also worked at the Department of Psychology, University College London, and at The Royal College of Art, London. He continues to maintain links with the Shell Centre for Mathematical Education at Nottingham. Here is an old CV. Research topics include face recognition and map design. Richard's son Will Phillips runs Stapleford Web Design and is extremely helpful on all aspects of web design. Contact: Richard Phillips, 4 High Street, Badsey, Evesham WR11 7EW, England. Updated 21 September 2015. Please link to this page at www.richardphillips.org.uk.